The similarities are uncanny. Two nations, both led by megalomaniacal demagogues with delusions of grandeur, both involved in costly (and ultimately failed) foreign adventures, both considered international pariahs and both subject to debilitating international sanctions. And if Kenyan Prime Minister Raila Odinga has his way, Robert Mugabe's Zimbawe may soon have something else in common with Saddam Hussein's <?xml:namespace prefix = st1 ns = "urn:schemas-microsoft-com:office:smarttags" />Iraq: US-style regime change this time delivered by African Union (AU) troops. The proposal, which has received Archbishop Desmond Tutu's blessing, is unlikely to succeed on two counts. First, it is unclear whether the famously spineless AU is up to the task. Its record and that of its predecessor the Organisation of African Unity (OAU) hardly inspires confidence. The deployment of an under-resourced and undermanned AU peacekeeping force in Darfur in 2004 did little to quell the violence there and the peacekeepers frequently became targets themselves. Even faced with Zimababwe's unpaid and unmotivated army (which resembles its DRC counterpart by the day), it is by no means certain whether the AU could muster enough troops and resources to get the job done. 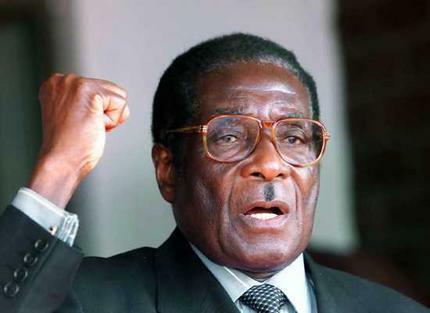 Secondly, while Zimbabwe's economic problems have undoubtedly been exacerbated by the undeclared sanctions imposed upon it by the US, it is also accurate to say that it is Mugabe's myopia and greed that led to the crisis in the first place (the economy was in free-fall way before the enactment of the Zimbabwe Democracy and Economic Recovery Act in December 2001, through which "Zimbabwe’s access to finance and credit facilities was effectively incinerated"). Many of the African countries that would be contributing troops to unseat Mugabe are similarly affleicted, even though the symptoms of economic malaise have not been demonstrated in as dramatic a fashion. It is unlikely that the likes of Meles Zenawi, Yoweri Museveni and Mwai Kibaki (to name but a few) would have anything constructive to add to a discussion on restoration of democracy in Zimbabwe. 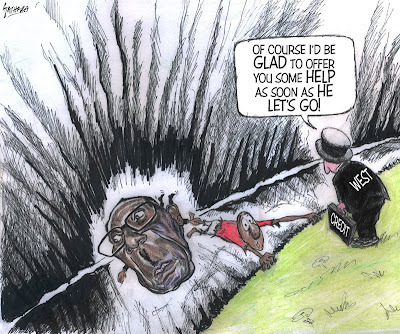 Perhaps Africa's rulers should first remove the straw from their own eyes before tackling the log in Mugabe's? In the meantime, I think the continued denial of international finance and credit facilities to Zimbabwe is abominable. Just like the 12-year Iraqi sanction regime, it hurts the people while doing little to dislodge the regime. While I support continued international pressure to oust Mugabe or at the very least secure a transitional power-sharing agreement, inducing a full-scale collapse of the country's economy is beyond the pale.